Alfie Evans' mother Kate wrote a beautiful poem on Facebook in honor of her little boy.... Alfie Evans died Saturday, April 28, 2018 after the hospital disconnected his life support without his parents’ permission. 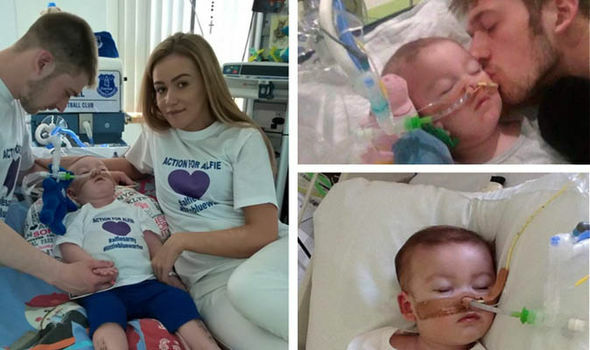 Alfie’s father Tom Evans spent the last 10 minutes of the 23-month-old little boys life desperately trying to give oxygen him with mouth to mouth. “My gladiator lay down his shield and gained his wings at 02:30 absolutely heartbroken,” Tom Evans wrote on Facebook. After his death, the family gathered at a park near Alder Hey Children’s Hospital to release balloons to honor the little boy. “I am deeply moved by the death of little Alfie. Today I pray especially for his parents, as God the Father receives him in his tender embrace,” Pope Francis tweeted on Saturday. Pope Francis repeatedly spoke on Alfie’s behalf and urged that Alfie’s parents be allowed to bring him to Italy; and even prompted a medical helicopter to be sent to take him to Italy for treatment.